The Wedding Chapel closed in 2004. 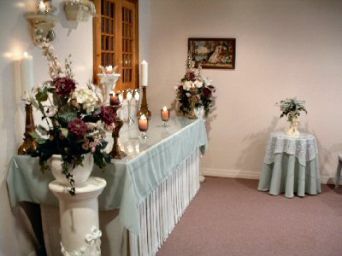 The Wedding Chapel was a beautiful, tastefully appointed, intimate, spiritual setting which could seat up to 30 guests comfortably. Opened in 1993, it was a place where couples could marry regardless of their religious affiliation. Since its opening, The Wedding Chapel fulfilled the requests coming from the gay community for Commitment Services or Spiritual Unions. With our service you received a copy of your commitment ceremony in booklet form and a certificate of commitment. Rev. MichaelHiltz, O.M. is an ordained minister of the S.S.F Inter-faith Ministries, Federally chartered and licensed by the Province of Nova Scotia. We are members of the International Council of Community Churches, an affiliate of the World Council of Churches. While we respect all religions, it is our belief that two people who wish to dedicate their mutual love have the right be married in a Spiritual setting and to dedicate their love for one another in the eyes of the God of their own understanding.